In a age where some 30% of the US adult population is technically obese, if you’re like most people, then you’re probably trying to keep an eye on your weight, and therefore on your daily food intake as measured by things like number of calories, grams of fat, or grams of protein. The good news is that 20 years ago, the US government decided to make it easier to know what you’re eating by passing the Nutrition and Labeling Act of 1990 which, among other things, required a Nutrition Facts label on most food products. The bad news is that many marketers have tried to subvert the intent of that act by using a non-integer number of servings per package, thus making it quite hard for most of humanity to figure out what they’re actually getting. Let’s take a concrete example: Buitoni Light Four Cheese Ravioli. 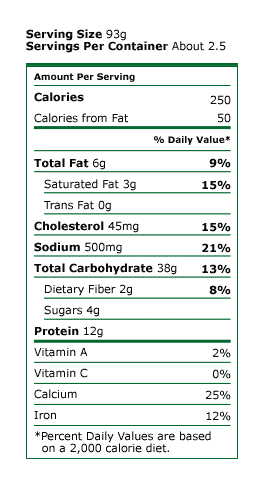 Let’s look at the Nutrion Facts label, assuming that we’re interested in calories and grams of fat as our key metrics. The label says the product has 250 calories and 6 grams of fat. But, not so fast, those figures are per-serving. So how many servings are there in a package? 2.5. Really? Wait, 2.5? Come on, did they really design the size of the package so it would feed precisely 2.5 adults? Were they targeting that small market segment of two adults and one eight year-old child who wanted to have (light) ravioli together for dinner? I don’t think so. While a hungry teenager could devour the package alone, for most adults I believe the package size is pretty clearly designed for two, which also makes sense when you think about the target market. In my experience, if anything, it runs on the low side of two portions, not the high side. So why would they say a package that was almost surely designed to feed 2 people contains 2.5 servings? There’s only one reason I can think of: to obfuscate the Nutrition Facts. Quick, what’s 250 times 2.5 divided by 2? Not so easy, huh? Quick, what’s 625 divided by 2? Easy, that’s 312.5, which is also the answer to the previous question and the actual number of calories you’ll get by eating half a package of Buitoni Light Four Cheese Ravioli. So, by doing this trick, I’m sure they get most people to think “uh, 2.5 is about 2, so it’s about 250 calories per serving” thus understating the actual calories by 25%. In researching this post, I learned that there are additional reasons why marketers might play with the reported servings per container (e.g., “healthy” claims are based on per-serving information), but this isn’t a food blog — it’s a business and marketing blog. So why do I care? The answer is trust. Specifically, corporate trust. Corporations spend billions every year on brand building and communication programs. If you asked any of those companies about their brands, you would hear phrases like: brand promise, brand trust, or faith in the brand. Or if you asked about their desired corporate reputation, you would again hear words like: integrity, trust, or faith. The thing about trust is that’s hard to earn and easy to lose. Nestle can — and presumably has — spent lots of money trying to convince me to trust the Buitoni Brand. To trust the quality. To trust the consistency. To trust — I was rather surprised to learn — its genuine Italian-ness. So that when faced with that agonizing moment of truth, staring in utter horror at the confusing array of fresh pasta products, so that at that moment, my hand would guide itself to the Buitoni label. And then you manipulate the servings-per-container and that trust is gone. Trust doesn’t just come from what you say. It comes from what you do. Too many companies forget this and, in little instants, undermine billions in marketing and communications spend. This entry was posted in Marketing, Trust. Bookmark the permalink.